The Mystery: The most resource rich nation on Earth has the highest electricity prices?! Ask anyone and get confused: It’s poles and wires, gaming of the system by capitalist pigs, excessive taxes, privatization, and record gas prices. The CleanEnergy Council tells us that Australia has one of the longest electricity networks in the world — we need lots of poles! And so we do. But once upon a time Australia had the cheapest electricity in the world and we still had lots of poles. Not only were miles of poles and wires, there were also capitalist pigs, excessive taxes, and privatized generators. There were wild gas price spikes too, (during which we probably just burned more coal). Evidently, something else has changed. Something seismic that wiped out all the bids below $50/MWh. Perhaps it has something to do with the 2,106 turbines in 79 wind farms that on random windy days might make 4,325MW that didn’t exist in Australia in 1999 when electricity was cheap and our total national wind power was 2.3 megawatts? Another clue might be the 1.8 million new solar PV installations, which theoretically generate 7 gigawatts of electricity at noon on cloudless days if all the panels have been cleaned. Back in 2007, we had 14MW. But of course, cause and effect are devilishly difficult. The one thing we know for sure is that even though sunlight and moving air is free, there is no country on Earth with lots of solar and wind power and cheap electricity. Any day now, renewables are going to make electricity cheap, but when that happens, it’ll be a world first. Source: Paul Homewood at NotalotofpeopleKnowthat inspired graphs by Johnathon Drake, and Willis Eschenbach, and Dave Rutledge, similar to this one. This particular graph came via Judith Sloan in The Australian, though I can’t seem to find the exact link. Australia is far above the trend-line. Our electricity is even more expensive than it should be for the amount of renewables we have. At a guess this might be because other nations have more “hydro” in their renewable mix and less wind and solar. Or they have access to nuclear power (like all the EU countries). It may be made worse by the way our energy markets are managed, the profusion of bureaucracies, the subsidies and rebates, the renewable energy target, or the overlapping state and federal green aims. It also may be that in our smaller market we have a few big players gaming a volatile, complicated market. Stability may cost more here, due to the fragility of our network. As Euarn Mearns says, there’s more than one variable at work here, but the inescapable conclusion is the countries with the highest levels of renewables pay the highest prices. h/t Don B. Is that another 10 cent price rise coming? From wiki wind power in Australia– As of May 2017 a further 12328 MW of capacity was proposed or committed. “AEMO Planning and Forecasting – General Information Page”. Retrieved 7 June 2017. Say it again: there is no country on Earth with lots of solar and wind power and cheap electricity. Impacts on the Australian Economy and Australian Consumers, Regulation Economics. Jo, Australians need their own TEA [taxed enough already] party; how do your people put up with this? And what about the residual effect on business … and of course, there is so much future cost built into this edifice, that people will not be able to afford to meet their energy needs. In general, politicians create disasters so they can benefit from them. Other than create disasters they do very little. They certainly do not try to fix problems unless there is an election. The political system can be easily debased to reward dependence. Maybe we are forgetting that this is entirely what the UN wants to achieve. The thinking is that the current economic and production systems are unsustainable and must be cut off at the knees to save the planet and mankind and return to a sustainable development pattern of a pre-industrial revolution style; Consumerism and throwaway society must be halted. Global redistribution of wealth is a major part of that thinking. Global Warming / Climate Change is the chosen mechanism to achieve this. “Isn’t the only hope for the planet that the industrialized civilizations collapse? Isn’t it our responsiblity to bring that about?” . and those encapsulate what lies behind and is the reason for ‘Global Warming / Climate Change’ . Christiana Figueres, executive secretary of U.N.’s Framework Convention on Climate Change “This is the first time in the history of mankind that we are setting ourselves the task of intentionally, within a defined period of time, to change the economic development model that has been reigning for at least 150 years, since the Industrial Revolution “ That must be taken in the context of Strong’s statements quoted above and the intent to de-industrialise the developed (but Not the Developing) world. Potentially a return to lifestyles of the 15th and 16th centuries. Here is a source for a similar graph which shows more renewables mean higher electricity prices, from Euan Mearns. Don, thanks, Euan has a great graph. Added. Renewables are akin to Socialism; it’s never worked anywhere, but the followers believe it’s because it hasn’t been done properly. You are absolutely correct. It doesn’t work, because the people making the decisions are mentally deficient – something seen by liberal socialists, as being a badge of honour. When it comes to power generation you need: 1. Sufficient power to keep essential services continuously operating 24 hours a day, 7 days a week. This includes all hospital services, transportation services (radio, radar and airfield lights), security systems (including street lighting) et al. These are the services that support the concept of civilisation, and the concept of preserving the peace. If you don’t have them, and some, then you ain’t civilised. How hard can it be, for those people in power, in Canberra, to get their collective heads around that? Jay Wetherill has misinterpreted the graphs. He no doubt believes it’s a competition to see which State/ Country can win first prize by moving to the pinnacle of the graphs. Carry on Jay, you’re already at the top of the “dumbass” graph. bemused. Socialism/Communism has “worked” in several places: USSR, Cambodia,Venezuela, and others. The countries that collapse are doing socialism/Communism properly. Those that suffer but do not collapse and not applying Socialism/Communism properly. No, no, no! The West interfered with the application of communism so that the ideal outcome wasn’t achieved. I mean fancy running a capitalist system, with nice homes, cars, consumer goods, leisure time, and food in shops when you want it without queues just over the fences keeping the happy communists in. How irresponsible. 2. To create the means for politicians to use 1 for the sole purpose of gaining the power they crave and to hold onto that power by creating ever-growing dependence on the state. Global Warming / Climate Change was a socialist-marxist creation to expand state control and, through fear, growing dependence upon the state to “solve the problem” and remove the (deliberately engendered fear of) future catastrophe. Socialism / Marxism fails as soon as they run out of other people’s money and trash their own economy. A clearer message would be to say those building many more coal and nuclear power plants have cheaper electricity. China and India are examples of that, for good reason – they desperately need cheap AND STABLE BASE LOAD electricity, something that both our major parties are vehemently against. China and India don’t even get a mention in this 2016 Energy Council blurb. The free market model is a failure, Premier Gladys should buy back the poles and wires. Is Australia worried about appearing like a third world country? Or is Australia intent on becoming a third world country, by stealth, or by default? If we have to play second fiddle to NZ its not such a bad thing, we are friendly cousins. I notice the Mainland has a rocket launching pad, my heartiest congratulations. Australian career politicians are clueless and unreliable, but the good news is that Beijing doesn’t want us to become a third world country. Would kiwis be offended if Oz drifted towards socialism with Australian characteristics? Yes Australia has been drifting towards socialism for a long time now but don’t just blame the politicians. We get the government, and more importantly we will continue to get the government the people elect. The people have the power, at least for now, to elect an alternative to the two major parties. The question, which is easily answered is whether enough will exercise that power next time given we are at a critical point. So in the end we get the government we deserve and thus much of the blame rests on the people, not the government. That’s how the democracy we currently have works, and always intended to work. Too bad not enough people use their brains to make the correct choice instead of acting like they are insane and keep focusing on the two major parties and still expecting a different result. What’s worse, which is the real clincher IMHO that proves most Australians are stupid, is we continue to place one party in control of one house and the other party in control of the other house of parliament even though we have known for some time now they play political games. Perhaps a more apt description of a most Australian voters today is they are schizophrenic, clueless, insane and stupid. Sorry but that’s how I believe an objective observer would see us from the outside. Peter the masses are not stupid, we have the Westminster system which puts a tight hold on excessive behaviour. The majors walk in the middle and the fringe dwellers don’t get much of a chance to make a difference. Don’t expect any change on the political front, its a Lib/lab consortium moving to the left. As far as my limited experience in this part of the world is concerned, Australia has always been socialist and drifting off somewhere or other. What I didn’t know, until you mentioned it, was that we have a rocket launching pad. I can’t think why we might want one. Perhaps we are in a competition to be the first country to put a sheep in space? That would be a very bad idea. Put one sheep in space, and they would all want to go. We knew from the start that this island was too big to populate, so we hugged the coast, except for Canberra which was a compromise solution. Politically we are drifting to the left and the bookies have Labor in front to win the next federal election, which means they will follow NZ and join Beijing’s Belt and Road. This will be a game changer. The question then arises, how long before we walk away from the Alliance? Asia needs lebensraum so Australia need to be depopulized by destroying the economy? The r-squared value in your figure is exceptional good. I’m an environmental scientist and regularly check others data… I remember one report said there was a ‘strong relationship l’ with an r-squared of 0.12… which is crap! So getting one above 0.8 with something that can have many variables… clearly shows there is a STRONG relationship between solar+wind and price. That author likely spent the rent money on lotto tickets. It is very hard for the average Australian electricity consumer to appreciate the difference in the cost of production of electricity from various sources when they are all thrown together in such a way as to hide the differences in production, delivery and pricing. The best illustration I could think of would be to have three separate plants built side by side somewhere where they could service a population of maybe a quarter of a million people each so that the total output would serve a population of 3/4 of a million. Each plant would be required to generate the same amount of electricity delivered at the front gate of that plant, 240 volts 50 hz and delivered day and night as required to service their 1/3 of the total population. The actual cost of delivery could then be assessed at the front gate of each plant; one plant running on coal, another on solar and the last on wind. At the moment we have an electricity supply system that is a politically inspired shambles where the separate costs of solar, roof top solar and wind can be hidden and effectively giving politicians and renewables advocats a free lunch. Of course it would not actually be necessary to build these three plants, it could be done on paper with engineers and accountants giving best estimates. Cheating aside, there is going to be an obvious winner: coal. The issue of power supply needs fixing with honest people at the helm. Unfortunately they won’t be found in either the left or right of the current political war for supremacy. With 62 countries building 1600 new coal fired power stations because they want cheap reliable electricity, I would have thought that even a dumb politician would work out that there was no point in renewables, so the conclusion is that our politicians wat us to have expensive electricity or that they are very, very stupid. All true Graeme but sadly politicians are followers and not leaders. If the general voting population thinks that “renewables” are cheaper, even free, then politicians must play to that. How do we get past the media bombardment that day and night, says coal is more expensive and more polluting than renewables? Sadly the demonstration by Vic and S.A. is not showing the problem because for every dynamiting of a coal plant there is a measured shutdown of business and manufacturing to let it seem like renewables are coping. When you see a windmill gracefully turning, as it sits upon the skyline, on a perfectly calm day, with the dying sun behind it, console yourself with the thought that it is not acting as a generator of electricity at all, but rather it is consuming electricity by acting as a motor to rotate the blades, in order to prevent uneven wear and tear on the drive bearings. This is a forbidden truth, that none shall mention. KK, I’m not sure the general voting population on the whole does believe renewables are cheaper – the BS feedback loop exists solely between the mainstream media, who hubristically believe they are arbiters of public opinion, and insecure politicians who buy into this lie (and also see the advantage of setting up cosy little nest eggs for themselves with renewables companies, green charities, eco schemes and so on). It’s sadly difficult to inflict any damage on the political class in the west without collateral damage, but I was cheered the other day when I realised how the green blob could be biting the MSM hand that feeds it. Like a lot of other people my energy costs are now so high that I can’t afford luxuries like newspapers and have recently had to cancel my sky TV subscription. The BBC license fee is next to go when I disconnect myself from the MSM ‘grid’, and I’m strangely happy about it, and expect that if my experience is common in the UK and Aus, media barons who have bought into green fraud (no doubt because they have their fingers in the same pies as the politicians) are set to take an almighty hit.. I often wonder why renewables with their layers of subsidies cost more under those selective schemes. Seems a classic area of market segmentation and being able to charge a premium for essentially the same product. The tobacco people did it masterfully for decades. A very good point Harp is. As one of my metallurgy lecturers used to say about complex matters: “it is intuitively obvious that” if, as they claim, renewables are so cheap, why do you have to pay a premium for them? You could even say it’s a total contradiction of the green claims. Sorry yarpos, autocorrect strikes again. Maybe I need a proof read a bit more. Maybe you need to proof read a bit more. – Just trying to be helpful. Maybe I need a to proof read a bit more. There you are Keith, fixed it for you! quality and reliability of electricity and gas services”by purchasing an overpriced unreliable product and passing it on to long suffering consumers who have no choice but to take the scraps tossed to them. If AEMA was a company, it would have gone out of business years ago, and its board and executive would have been largely unemployable in the real world. concerns about climate change and the need for a stable long-term framework for investment in energy supplies.” The technology they are using to do this does not reduce CO2 emissions so they are failing here. Perhaps a class action against AEMA as a monopoly regulator that effectively mandates poor business practices that have resulted in business closures, the poor not being able to afford power and the lack of reliable power supplies in what is allegedly a third world country. Of course by AEMA I mean the COAG Energy Council! Against the AEMO, AER, [insert group here] for incompetently not advising the government and people of Australia on the real costs and risks involved with renewables. I was having a bit of a rant and wasn’t thinking AMEO was the target of my ire! It has been stated before that there is a widely held view that all kWh are equal. I expect only a small minority appreciate that the wholesale price of electricity varies widely now that the reliable generating capacity has been reduced to the bone. When the mercury rose and people from Perth to Penrith were trying to beat the heat, Federal Energy Minister Josh Frydenberg lost his cool in the debate around the nation’s energy policy. The Minister has yet again come out swinging at South Australia’s sensible renewable energy leadership in an attempt at political point scoring . In the midst of the recent heatwave Minister Frydenberg has been blowing a lot of hot air about limitations on wind power and South Australia’s need for coal and gas, but he hasn’t said anything about rooftop solar. Not. A. Word. The truth is, last Thursday South Australian solar owners produced more power than the capacity of the now-closed Northern coal-fired power station in Port Augusta, reducing and deferring demand peaks in the summer heat . We can’t let this fly. While Frydenberg is silent on solar, we’re getting louder. Will you chip in to make sure our collective voice echoes in every corner of the country? When it comes to transitioning to a clean, renewable energy future we can’t settle for half-measures and blame-games from the Federal Government. The National Energy Guarantee (NEG) will slow down investment in renewables at a critical time when states such as South Australia are developing world-leading solar and battery innovations . You and I both know the way forward is clean, renewable technology, but the Federal Government is determined to keep playing desperate politics and put solar on the sidelines. This summer we’ve been collecting powerful stories from Solar Citizens just like you, so we can deliver real-world experiences to newspapers in every state and politicians in every electorate. Together, we’ll continue to make sure the voice of solar owners and supporters are heard by MPs and are in the media. You and I are the voice of solar in Australia, and our voice will only get louder until 100% renewable energy is a reality. Click here to chip in and amplify the call for a clean, renewable energy future. When millions of solar owners and supporters stand together, we are an unstoppable force. We can and will protect and grow renewables in Australia with your help. Wetherill is portrayed as the hero leading the path to righteousness, fighting against the evil CO2 supporting Frydenberg. I thought that they were basically on the same ticket. That reads like an example from Propaganda for Dummies. I can appreciate good propaganda – it has class and style and a certain poetic power. This piece however, by “Solar Citizens” (who apparently live on the sun), is an insult to anybody with more than a single digit IQ. All electricity providers should have to sign a guarantee that they will provide a minimum of 80% of their nameplate capacity at all times. If the technology they are using cannot do this at an economical price, then they should leave the market and not return until they have something that works. And they should be required to dismantle existing generating equipment if it cannot perform to that minimum. I dream of the day when there are no more eco-crucifixes physically and visually polluting the environment for no real contribution to our power generation. You left out competence as part of the equation, KK. The fundamental problem is that we have too many air-headed pollies totally lacking in both honesty and basic competence. For a graphic encounter of the nature of the battle, see this recent exchange between Jordan Peterson and Cathy Newman, not on the subject of electricity supply, but the clash of enlightenment on one side and bog ignorance on the other. It is also an object lesson on how to conduct an encounter between the loonie left and a confident and well-prepared adversary. Allen, I watched that with my mouth agape – i had not heard of Jordan Peterson before but I have since found him on YouTube. He is quite amazing as a supporter and promoter of free speech. The moment when the lefty interviewer, Cathy Newman, was struggling to find the next question after Jordan had demolished her last, was pure gold, as he just smiled and said ….. “gotcha”. I would strongly recommend that everybody on this site clicks on Allen’s link and follows this guy. I believe he is coming to Australia – a more polished and understated Milo, but just as effective. The contention by some that prices will come down as the renewable energy industry beds in is also not supported when you consider a country like Denmark which has been at the fore of wind power since at least the early 1980s. It still has expensive energy. On what basis do spruikers like Finkel, Flannery…or pretty much most of the MSM suggest the cost of energy will ultimately come down? Other than deindustrialization will decimate demand, which is the goal. Denmark is a special case, because we have a lot of interconnetions to hydro in Norway and Sweden. I wonder where Norway would be in the graph, they have 97% of their electricity from hydro. Look at this site for most of Scandinavia and Balticum. My own explanation for the high price in Denamrk is the support of windmills and the interconctions/backups needed to balance the variable production. As soon as you buy it ? The graphs are interesting. I’m not sure if they indicate the excessive cost of doing things in Oz, our inate ineptness in executing projects, or the unsuitability of renewables in our situation without energy rich neighbours. Maybe a cocktail, answers are never simple. The time is rapidly approaching when Premier Daniel Andrews will be obliged to use his regulatory powers to shut down the Victorian interconnect to South Australia on very hot days, thus ensuring power supply to Victorians. Failure to do so, and therefore see sections of the Victorian grid and industry shut down while Victorian generated power is fed to SA, is likely to result in legal liability for the Victorian government. Lets see what dreamer Weatherill says then. But you are forgetting the Nationally organised mutual screwing session with VIC supplying SA, whilst NSW is behind, supplying VIC (with some support from TAS), and QLD on the top satisfying NSW ‘s needs when asked ! Its a mess,..not pleasant to watch , and eventually someone will not be able to satisfy its partners needs ! … eventually someone will not be able to satisfy its partners needs ! The Vic-SA interconnector was throttled last week during the supply squeeze that caused the high prices. Both Victoria and SA had high demand at the same time on the same day. All that could be supplied through the link was as low as 172MW at the peak price period. That level almost balanced prices between SA and Vic. NSW did not suffer the supply squeeze so I guess the Vic-NSW and Tas-Vic links were at their limits. Queensland and Tasmania are potentially the only states in the NEM with surplus generating capacity. SA is on the end of line. I expect AEMO would do its best to balance load shedding across NSW, Vic and SA within the limits of the interconnectors but being on the end of the line increases the prospect of SA being first off. The Interconnector was used like a perpetual generator in Sept 2016, running at full tilt, as if it could not fail. If it were treated like a normal generator, the AEMO rules are that there needs to be some proportion of backup on standby. Hence it gets limited now to much less that peak capacity, so that in the event of something falling over in SA, it has capacity to pick up the slack, and also if it itself falls over, there is some back up capable of covering it. I presume it means that SA has to run more gas now (more exxy electricity) to make up for the 200-300MW gap. It’s the new economics theory created by politicians, use taxpayer’s monies to subsidise things that are not marketable or cost effective and then charge taxpayers a lot more for the extreme Green socialism masquerading as environmentalism service or whatever. And don’t forget to keep borrowing to spend even more, the taxpayer’s will cover the interest bills. The word to describe these traitors is unprintable. But once upon a time Australia wasn’t a renewables crash test dummy. Seems the problem now has more to do with the number of polls, and how they rig them. Hopefully the high costs that even the most deluded Greenies will have to deal with will change that. How do you spell Trump in Australian? And you can see that Poland which has a higher per capita proportion of Poles, is well down the scale. Thank you Jo, I am still watching the sea level of Tuggerah Lakes, as I have since 1986, and no, still no rise, not even 1cm. Sadly, most of our “leaders” in Australia are Humanist Globalists who worship creation, to the point of group idiocy. Bruce you need stop watching the sea level and start watching the sea bed. Despite promises of easy beach access for inner suburban Australians, the sea has to this point failed to match alarmist predictions. The reason why, at least according to climate sciencemagologists, is surprising. Good to see those ex-Eastern Bloc countries are at the low end. No surprise really, they know propaganda when they see it. Answer: AU has been “fleeced”. More specifically by Alex Turnbull and his Father, Malcolm. “With Infigen’s shares tanking to around $0.20 in 2014 and trading at that level through most of 2015, in the latter part of that year – through his hedge fund, Keshik Capital – Alex began pouring money into an outfit that had been losing it faster than a drunk in a casino. On 5 Jun 2016, Alex Turnbull’s shares went from $0.20 to $1.20. A gain of 600%. I’m sure it is nothing but a coincidence. You see, Alex was “Born Lucky”. I just added this article to a comment on GWPF, and Fakebook called the post SPAM! Fakebook is more ridiculous every day. Fakebook is a dangerous thing. Where else might one willingly input permanent data into a politically driven database that can end up costing one his/her career, marriage, security clearance, friends, family, and life? I don’t play that game. The juice isn’t worth the squeeze. However convenient if may be, it isn’t an Honest Forum, nor is it a wise endeavor. Email works perfectly well for personal things. Fair and Honest forums like JoNova are worth the time to peruse, participate in, support, and exchange ideas. Civilized peoples must take their own lives, cultures, and futures to heart and defend them well. There are already too many hyenas at the gate. I have one such account purely to allow logins to places that want Fakebook and/or it easier than registering. Some of the suggestions I see on the front page as I pass through are a scream. Thank you Tom — both for trying and for reporting it. Perhaps I’ll even try on my own facebook page? Good reminder. They may be the enemy, but getting in there is better than not trying. The US was well on its way to mirroring the plight of AU. That course got changed up with the election of Trump. We pay on average, $0.12 / kWh. AU pays, on average, $0.29 / kWh. AU may have originated as “prisoners of the Crown”, but US originated as “traitors to the Crown”. In a sense, AU and US are kindred spirits. We simply preceded Brexit by some 240 years. It remains to be seen if Western Civilization can overcome the idiocy of its “educated and elected incompetents”. I, for one, hope we shall. No Engineer nor Economist worth their pay would countenance the “alternatives” insanity. China isn’t. India isn’t. Russia isn’t. No, it takes a “special kind of stupid” to embark upon the debasement of their own economy and people in order to be “liked” by people who hate them for unproven and unprovable reasons having mostly to do with sketchy models and historically disproved claims about the future. Who are you going to believe? Models, political claims, navel gazing religions, or your own lying eyes? The problem with getting your information from a newspaper is that it is so very often wrong. The graph you display conveniently omits China (lots of wind and solar, 4c/kWh) and Canada (lots, 15c/kWh), to say nothing of a host of other countries whose power prices do not suit the journo’s narrative. 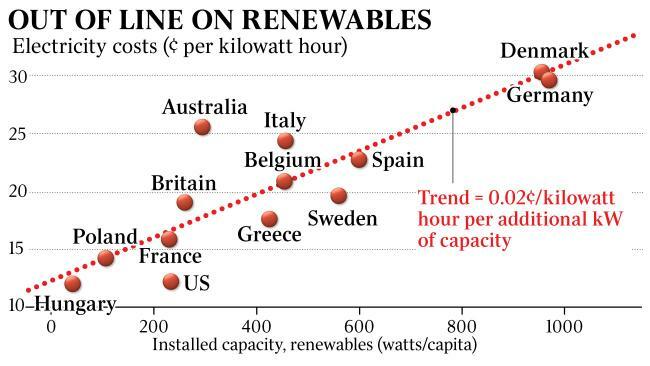 Also, Australia’s position on the x-axis of that graph is mostly down to hydro, not wind and solar. So in fact Australia’s high prices do not fit into the narrative at all. If you add on all the countries, adjust for GDP per capita to get the real cost of electricity, and then remove the hydro component, the narrative falls apart completely. Of course, the “trend” line superimposed on the graph is not even a trend, let alone accurate or meaningful. For example, Germany is currently paying (via high prices) for its recent crash-building of a host of new coal-fired power plants to replace its nukes – not something that is reflected in Judith Sloane’s nonsensical implied correlation. The problem with some information posted is that it lacks references and is therefore indistinguishable from unfounded claims. Take for instance the claim that China pays 4c/kWh. It is closer to 8c/kWh. If you add in all the subsidies and adjust for the deprecation of thermal plant economics by means of politically based RETs , it is quite apparent that the entire construct of Renewables as a viable resource for any modern civilization is a fantasy. Craig, I did better than “a newspaper” — I linked to blogs that link to official sources. Unlike you, who just posted numbers with no source at all. China BTW has so much coal, such a raging excess of coal power, that there is talk of building an interconnector to Berlin to help them out. As for Canada, they have a lot of Hydro power, that’s why their renewables tally is up, but not their electricity bills (not to our extent). And our hydro — what are you on? — should be reducing the bill, not putting us up in expensive-land on the top side of the trend-line. We had hydro remember, when our electricity was cheap. China’s electricity generation is dominated by coal (>65%), with significant amounts of hydro (17%), and modest amounts of wind (<4.5%) and nuclear (4.0%), and insignificant amounts of solar (1%). Canada’s electricity generation is dominated by hydro, with significant amounts of nuclear. The provinces that aren’t hydro rich use coal and natural gas. Ontario, which heavily subsidized wind and solar installation, saw a significant (for Canada) rise in electricity price which will probably cause the fall of the current ruling Liberal government. You see Craig, the problem with believing people who tell you things you want to hear, things that are in fact wrong, is that you make yourself look a little silly. ….. omits China (lots of wind and solar…..
You look at the Nameplate and see that compared to other Countries, that total is huge. However, when you actually look at the total power actually generated, and when compared to the overall total power generation, it is considerably less than in other Countries. The total power generated by wind averages out at around 5.6% or so in most Countries, whilst in China, that power actually being generated comes in at barely 4%. The same applies for Solar Power which in China barely manages 1%. Nameplate might be huge, but it means nothing if all that Nameplate cannot actually deliver power for consumption. So, Craig be very careful where you take your data from. Leftie journalists who think that the believers rely on them for the truth haven’t a clue where to look to find actual generation data. You should add Holland to the graph, and maybe India, to get a good view of how amateurishly wrong the graph is. SOunds like you already have done that, why not post your work? We take a graph from another source, as an example of what the article addresses, and along comes Craig, late to the party, and complains that the original graph doesn’t include Holland and India. How petulant. Did you actually manage to read and understand the thrust of Jo’s article, Craig? Or were you so quick to find fault that you totally missed the plot? I would suspect the latter. It would be par for course for you. Why not follow Dean’s suggestion? It would go some way to restoring whatever credibility you might have had in the past. Can I propose Homer Simpson for a Nobel Prize for the entirely applicable scientific phrase – DOH! FFS you can’t get free energy on demand and the idea that you can is purely junk science, for Gods sakes. There is always a price, a balance that needs to cycle itself out. The concept of sustainable electrical energy makes no sense unless you are the most brilliant mind since nobody else. Even if we could generate massive amounts of energy from the sun, wind, the tides or farts of the many crappy politicians that impose themselves on our lives, we CAN’T store that energy for when we need it. This is a simply understood concept that probably dawned on some Neanderthal whilst staring into his fire. The vanguard to all this is the independent mind. We come here courtesy of Jo as independent thinkers and a collection of independents Trumps a Literary Con of fakers. Jo…..you and Euan might want to do an analysis of Ontario, Canada electricity prices over the past 15 years compared to the rest of Canada and internationally…..several years ago, Ontario arbitrarily closed several coal-fired plants and installed thousands of wind turbines…..the result has been a doubling of electricity prices with more increases baked in. Hi there, the first graph says 0.02 cent/kWh per installed kW. This is off by a factor 1000. It should say 0.02 cent/kWh per W or 20 cent/kWh per kW. Interestingly, if you consider California’s renewables, the capacity and price are right up there with Germany and Denmark.